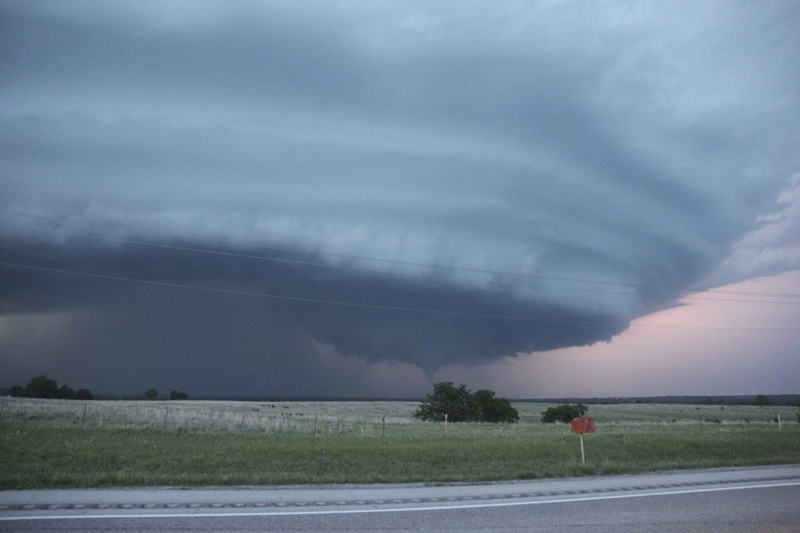 Storm Chase Logs: Structure Heaven ?? 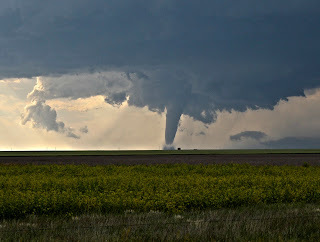 On this blog I thought it would be a good idea to show that it's not all about the Tornadoes!! On many occasions the structure of the Supercell more than makes up for a long day in the field and the frustration of not seeing the finger of god! Many chasers (Myself Included) would gladly take an out of this world photo opportunity over a wispy tornado which has occured with what we call a grungy looking storm. 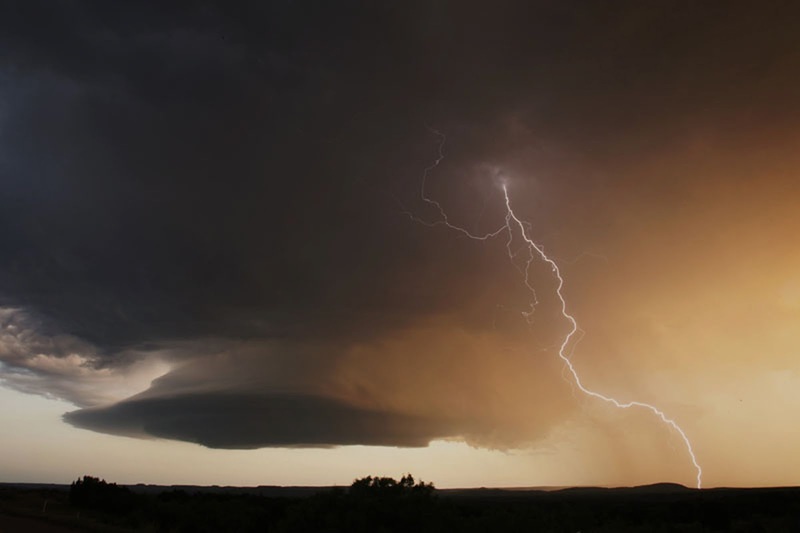 There are 3 different types of Supercell and each has there own tell tale structure and there are decent hints and tips on what you are looking at in the field and you should quickly learn the different types of Storm from just visually seeing them in front of you. Tornado Alley tends to get strange and amazing looking storms not seen elsewhere in the world due to quite a few factors, a big factor is the dry air pushing into the western side of a storm on a dryline day, these storms which can easily rise to 40,000 - 60,000ft into the Sky look like sculptures. The LP Supercell can take on many shapes and forms, these can visually be stunning and be taller than they are wider on occasions, sometimes you will not even note any visual precip falling when looking at the storm from an east position, this more than likely is because Hail is falling on the storms FFD (Forward Flank). These Supercells tend to form along the dryline in parts of the Texas Panhandle, Oklahoma Panhandle or Western Kansas, they can sometimes be reluctant to leave the dryline especially if the dryline is stationery for instance, I have also seen these Supercells leave the dryline and shrivel into a single cumulus cloud within 20 minutes before as well, more often than not the LP Supercell will transition into the Classic Supercell which we will come onto next. Hail is the major concern with LP Supercells and can regularly contain 4" Hailstones on its Northeastern Flank. Above is an LP Supercell with Bell Shaped Updraught sitting 15 miles North of Childress in the Eastern Texas Panhandle on the 30th May 2012. This storm upon leaving the dryline shrivelled and died within 20 minutes. A very Skinny LP Supercell which dropped Golf Ball sized Hail at our location just North of Ardmore in Oklahoma, not you cannot really see any precip on its forward flank (Right hand Side) but 2" Hail was falling in this picture. A beautiful LP Supercell in the Eastern Texas Panhandle near Silverton in May 2010, this storm would hit our location with baseball sized hailstones, notice the UFO shape in it's appearance. The Classic Supercell is the nirvana of storm chasers, this is in my opinion the easiest Supercell to chase, they very often follow textbooks you read with a rain free base on the Southern and South Western side, a heavy precip or hail core on its North or North Eastern side and a pronounced clearly viewable wall cloud and mesocyclone making it easy to see any rotation and Tornadoes that do form. 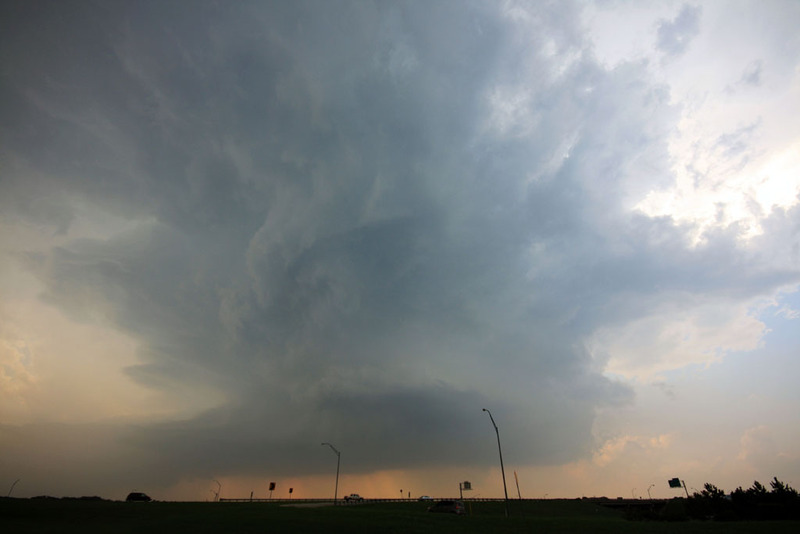 Most of my best structure pictures have come from chasing Classic Supercells as you will see below. 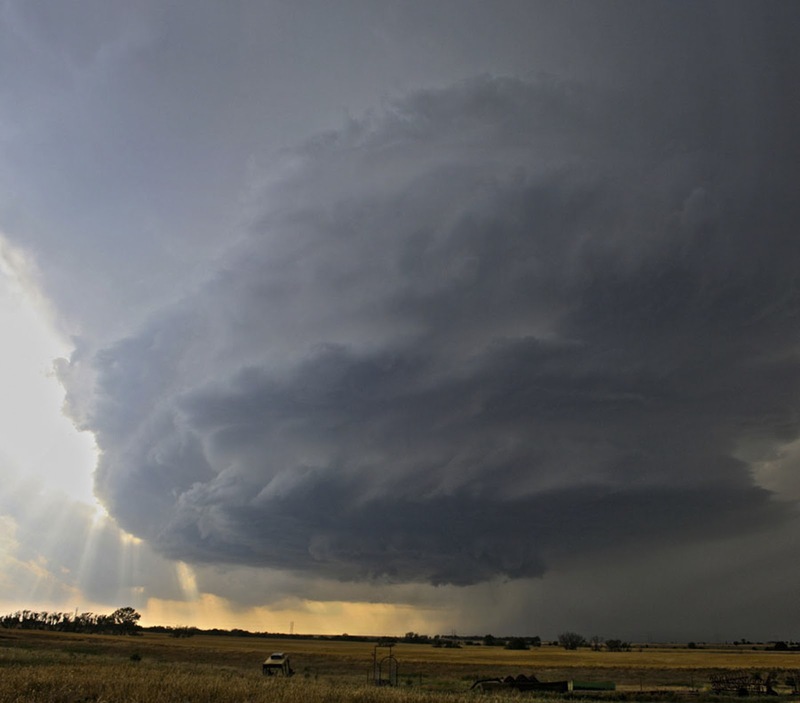 A Classic Supercell in the Prairies of Colorado (above) near Campo on 31st May 2010. Notice the rain free area to the left of the Tornado, the heavy precip to the tonadoes north east to the right of the tornado and easy to spot features such as the mesocyclone and wall cloud. A Classic Supercell (above) near Wynewood (Oklahoma) this storm started as an LP Supercell along the dryline and morphed into this amazing Classic Supercell dropping 4 Tornadoes along the way. Again it is easy to pick out the features such as the Striations (Rotating Storm) the bowl shaped mesocyclone and developing tornado underneath, we viewed this Supercell from the South West and the precip core is to the storms North (to the left of the tornado). A Classic Supercell near Kingfisher (Oklahoma) on 29th May 2012, again you can notice all the features of this storm from the striations to rain free base to mesocyclone, again it's precip and hail core is off to it's north and north east. This Supercell started off life as a very weak LP Supercell and took about 2 hours to transition, it ultimately ended it's life as a big old HP Supercell which would go onto drop 6" Hailstones over Oklahoma City a few hours later. 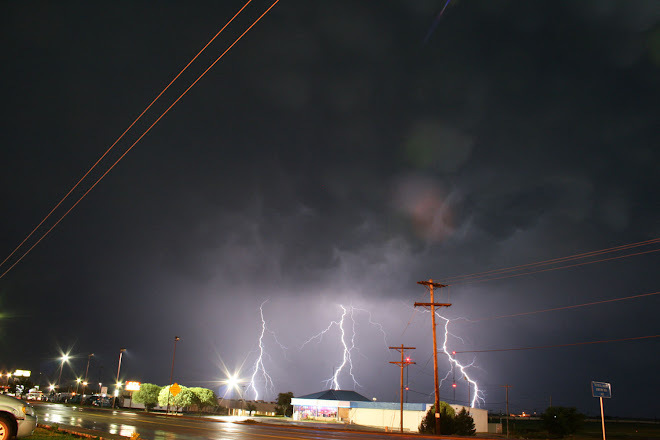 These storms are generally the hardest to chase, they also include pretty much every single arsenal possible to try and catch the stormchaser out, with large hail, rain wrapped tornadoes, strong rfd and zero visibility at most times, with this type of storm core punching although sometimes necessary is not recommended. The upside to the HP Supercell can be the stunning shelf clouds and photo opportunities it can lend itself to the cameraman. These storms can also be very big, sometimes 10 miles in width and once caught inside one of these it is very hard to get out. I tend to find these types of Supercells occur along Pacific Cold Front events and morph into a QLCS quite quickly so the chaser will only have a few hours of opportunity with these types of storms. A HP Supercell near Roswell (New Mexico) on the 13th May 2012 - Notice how most of the features are hard to locate, this was taken as the Supercell was gaining strength and only 25 minutes later the whole sky was filled with the shelf cloud and heavy precip with no dissernable features viewable for us. 2 HP Supercells collide in Minnesota and start to form the tell tale NE-SW Line, again note the shelf cloud racing ahead of the storm, the only way to see tornadoes with this type of storm is to generally dip your toes inside and take some pain and then get back out. HP Supercell pictured near Shattuck (Oklahoma) on the 11th June 2011. To be fair to this picture there are still Classic Supercell elements within the picture and this was taken as the transition to HP Was in it's final stages, about 15 minutes after this picture was taken we pictured a very brief Tornado before the storm gusted out and threw a massive shelf cloud South Eastwards ahead of the storm leaving us with tonnes of Lightning to shoot in the darkness. Well I hope this post has been of some help and hopefully when we hit the Plains in May and these stunning storms come into view we will all be a little more clued up on what is forming in front of our eyes.